Generally speaking, I don’t consider most Lego builds ‘art’. Most of the time, builders just want to make a cool castle or spaceship or whatever. When someone wants to convey a message through a build, it’s all too often done in a heavyhanded manner. Not so with this scene by Brian Rinker (Âtin). The construction and technique is all top-notch, but it’s the understated framing here that transcends the medium. At first I was like – ‘oh this is a nice little scene in a room’. Then I saw the note and was ‘whats that all about?’. Then I saw it. “…the understated framing here […] transcends the medium.” Exactly. One of the most evocative builds I’ve seen in awhile. Wow. That moment when you see it. Making that happen is art. I have to profoundly disagree with a statement in this post. I consider all the MOCs featured here as art. TBB is a showcase of the best that comes across our desks in a way, so those pieces are definitely art. The phrase I use on Deviantart all the time is that “MOCing is kind of like sculpture, engineering and poety all wrapped into one art form.” That’s more in the case of Constraction MOCing though, The caveat that could be added to others is “architecture,” and “interior design” for stuff like buildings and scenes like this. 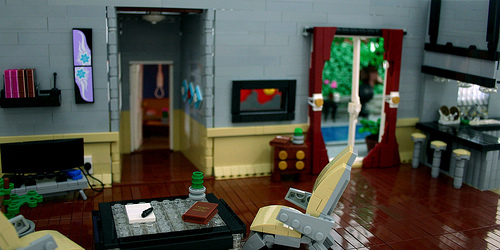 Its very refreshing to see something evocative done in Lego. I wish there was more stuff that was like this in lego. Now that I think about it, I don’t think I’ve every really seen an “X rated MOC” before something that is so provocative that it’d probably stir up controversy and “feels” It’d be really cool to see some MOCs in the spirit of Chet Zar or H.R Giger, some really dark macabre stuff like that. Would TBB even allow “disturbing” MOCs to be featured? Lastly, I love that the MOC was designed around the actual composition of the photo. That’s something I’ve never seen before. Truly inspiring. Over the years, there have been various models on TBB inspired by or based on designs by Giger, but X-rated in the sense of sexually explicit is something that I’d personally not be happy with. MOCs like that definitely exist, though. I completely agree with Carter in that I don’t consider most LEGO builds as art either, in the same way that I don’t consider an Airfix model of a jet aircraft to be art. It’s creative and clever, but for something to be considered art, I think it needs something more. This build really is very thought provoking on several levels. I’d love to see more of this kind of thing, but I suspect that few of us have it in us to build this kind of thing and pull it off tastefully. I don’t think of most MOCs I see as art, but there are certainly exceptions, and I think the feature build here qualifies. I don’t presume to dictate what others build or TBB chooses to highlight – Lego is a creative medium and it’s really only our inspiration and creativity that limits what Lego can be. If we can build vehicles and scenes of dreadful violence, I don’t see why someone shouldn’t be able to build something say, “X rated” if they like. But I also don’t think that Lego as a medium lends itself well to that generally speaking – unless you’re deliberately incorporating some measure of humor.